Ukraine’s President Viktor Yanukovych intends to sign a deal on closer EU ties after all, EU foreign policy chief Catherine Ashton has told reporters. She was speaking as pro-EU protesters continued to paralyse the centre of Kiev over the president’s decision not to sign the EU association agreement. His U-turn late last month followed pressure from Russia. President Vladimir Putin said in Moscow on Thursday he still hoped Ukraine would join a regional customs union. But he emphasised that Russia did not want anything imposed on anyone. 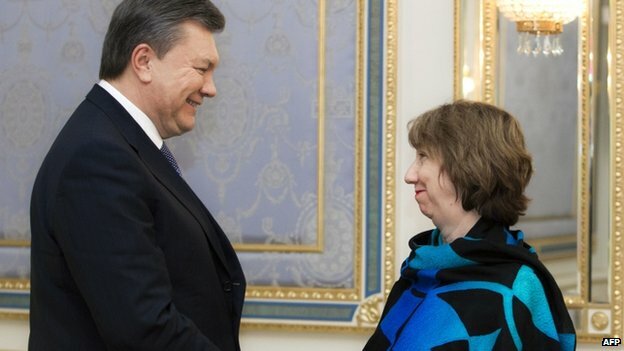 Baroness Ashton told reporters in Brussels that Mr Yanukovych had assured her when they met that his aim was to sign the EU agreement. But she gave no indication of when she expected this to happen. She said his concern during their talks was the “short-term economic issues” that Ukraine faced. Mr Yanukovych pulled out of the deal last month, explaining that Kiev could not afford to sacrifice trade with Russia. While adding that he still aimed to sign the deal, he said Ukraine would need at least 20bn euros (£17bn; $27bn) a year to upgrade its economy. The Ukrainian government’s handling of the pro-EU protests in Independence Square in Kiev has met with a stern response from both the European Union and the US. Police moved into the main protest camp in the early hours of Wednesday, prompting US Secretary of State John Kerry to express “disgust” at the government’s treatment of a peaceful protest. At least nine people were detained and there were some reports of police using violence. The US state department said later it was considering a range of responses including sanctions. After her meeting with Mr Yanukovych on Thursday, the EU foreign policy chief said she had insisted on the release of anyone arrested because of the protests and that the Ukrainian president had assured her that would happen. Moscow is concerned the EU free trade deal with Kiev would flood the Russian market and wants Ukraine to sign up to a Eurasian customs union that includes Belarus and Kazakhstan. Armenia and Kyrgyzstan are also planning to join. 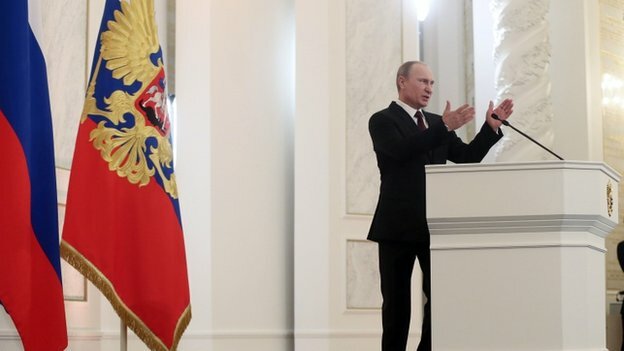 In his annual address to the Russian parliament on Thursday, President Putin said he hoped a solution to Ukraine’s crisis could be found and insisted the customs union would not be forced on Kiev. “We are not imposing anything on anyone, but if our [Ukrainian] friends want joint work (on the Customs Union) we are ready for a continuation of that work at expert level,” he said. 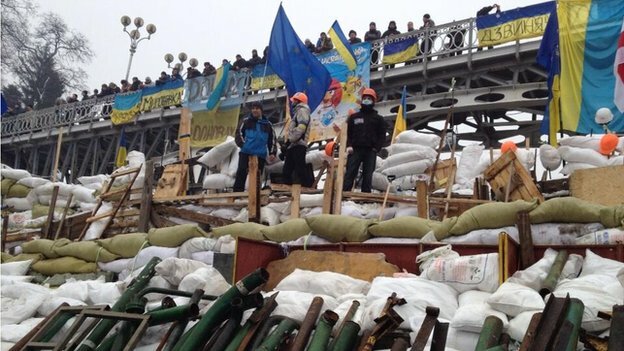 Pro-EU protesters have filled the centre of Kiev since Ukraine pulled out of the EU deal. The biggest demonstration so far was at the weekend, when hundreds of thousands of people thronged Independence Square and a short distance away tore down a statue of Lenin. 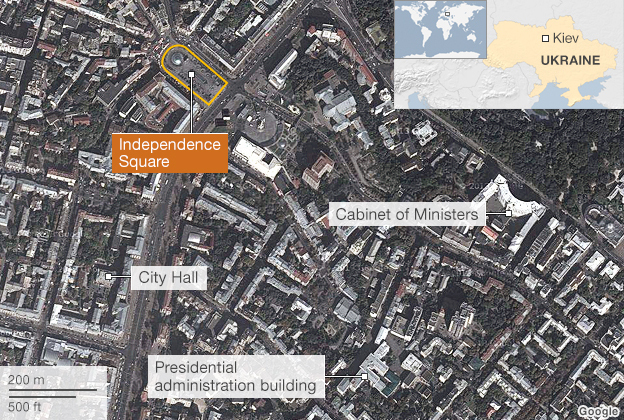 BBC correspondent Steve Rosenberg described the barricades in the square on Thursday as bigger than ever. Protesters erected barriers of metal pipes and sand bags packed with snow to ward off any further attempt by the authorities to empty the square.